Barely a year after freeing himself from the grips of controversy,local football icon, Charles Taylor, is the subject of contention following his linkage to a move to the Arab world.But before the Asante Kotoko star embarks on his new career, his former club,Hearts of Oak, have reminded Kotoko of the 60 per cent share of Hearts in the event of the player's transfer to another club. In a letter dated November 30, 2004, and signed by Board Secretary, Ernest Thompson, Hearts asked the GFA to compel Kotoko to sign and send their copy of the document that transferred Taylor from Hearts to Kotoko by the close of work yesterday.Failure to comply, according to the letter, Hearts would be compelled to seek legal redress. "As convenors of the arbitration, we wish to inform you that to avoid the transfer (of the player) becoming a subject matter of litigation which may involve seeking, among others, injunctive reliefs on the issue of a grant of an International Transfer Certificate by your body, we wish to request you once again that you advise Asante Kotoko to sign and return to us without fail by close of work on Thursday, December 2, 2004, the said contract. 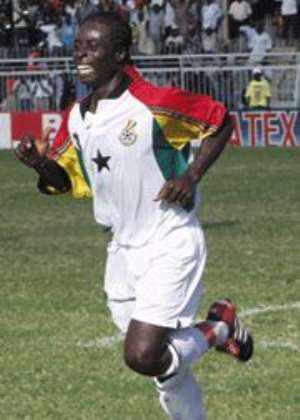 "Notice is hereby given that we shall not hesitate to seek immediate legal redress on this request if it remains unheeded by the date herein stated above," the letter concluded.Taylor, then reigning SWAG Footballer of The Year, left Hearts under controversial circumstances that earned him a four-month ban from the GFA. His record ¢400 million transfer aside, his move cost Kotoko a total of ¢850 million,¢600 million of it being a fine imposed on the player for what the GFA then called his unilateral abrogation of the contract with Hearts. Further controversy,however,arose when the GFA reversed the verdict and asked Hearts to refund the ¢850 million in the view of the GFA, upon a realisation that there was no contract between the player and Hearts.